Texas Ends Contract With Group That Has Run Alamo For More Than A Century : The Two-Way The news, reported by the San Antonio Express-News, is a step toward a "brighter future" for the Alamo, said Land Commissioner George P. Bush and the Daughters of the Republic of Texas. 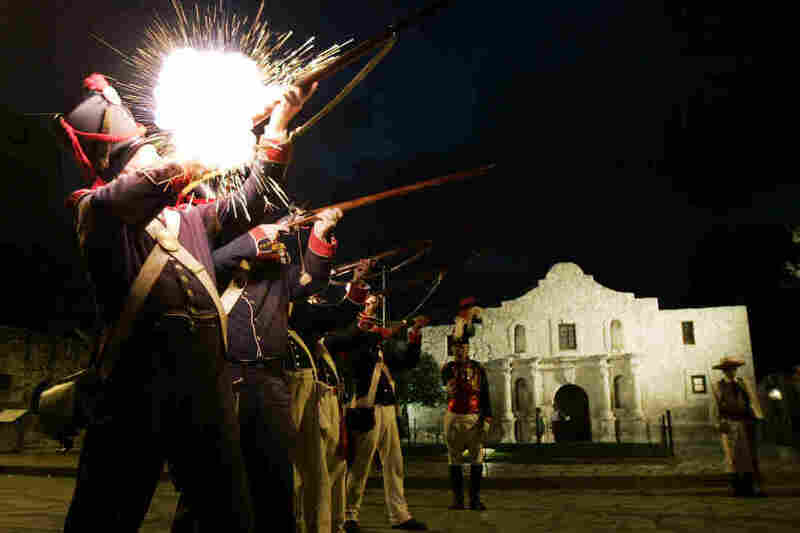 Members of the San Antonio Living History Association fire a volley as they take part in a Dawn at the Alamo memorial service at Alamo Plaza in San Antonio on March 6, 2006. Texas is taking back the landmark from the Daughters of the Republic of Texas, which has run the Alamo for more than 100 years. Texas is ending its contract with the Daughters of the Republic of Texas to run the Alamo. The San Antonio Express-News is reporting that the move ends the organization's more than 100-year-long management of the landmark. The change will help "create a bigger, brighter future for this Texas shrine," Texas Land Commissioner George P. Bush said in a joint statement with the DRT. The newspaper reported that the contract with the DRT, which runs through Aug. 31, 2016, will be terminated July 10. The Land Office plans to launch a nationwide search for a company to manage the Alamo, the newspaper reported. The Alamo was the scene of a major battle in the Texas Revolution; 180 defenders were killed at the site during a siege by Mexican forces. Texas eventually gained independence from Mexico.